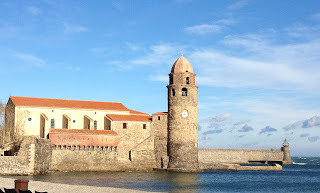 It was a day full of beautiful surprises as I got to see incredible scenery while exploring the wine region of Roussillon. I started the day with my favorite French breakfast of yogurt, fruit and pan au chocolat. I never eat the same thing for breakfast at home, but this seems to work well to start a day of wine tasting. Virginie Hurault from Vins du Roussillon picked me up at the Hotel Metropole in Perpignan for our trip to the mountains and the sea, further into the south of France. The scene was like nothing I had scene. There were vineyards up mountains and in what looked like black dirt. 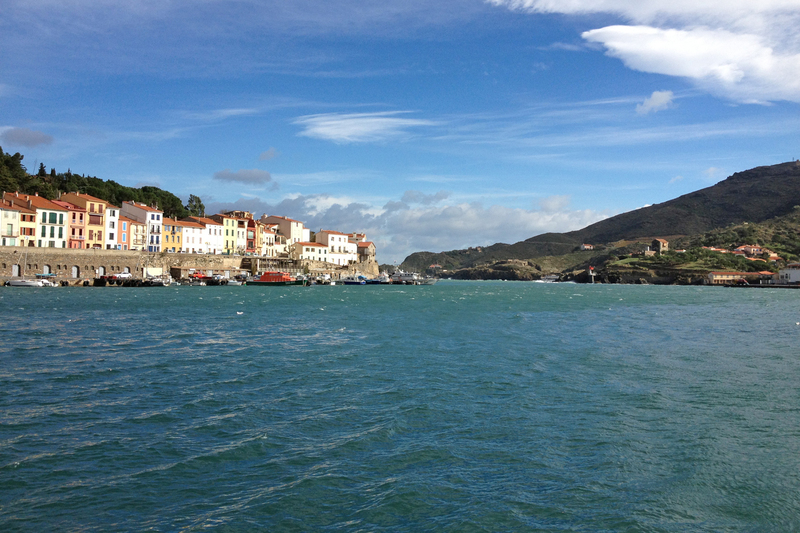 The Mediterranean Sea was a glimmering turquoise and the houses on the hillside were unmistakably European. 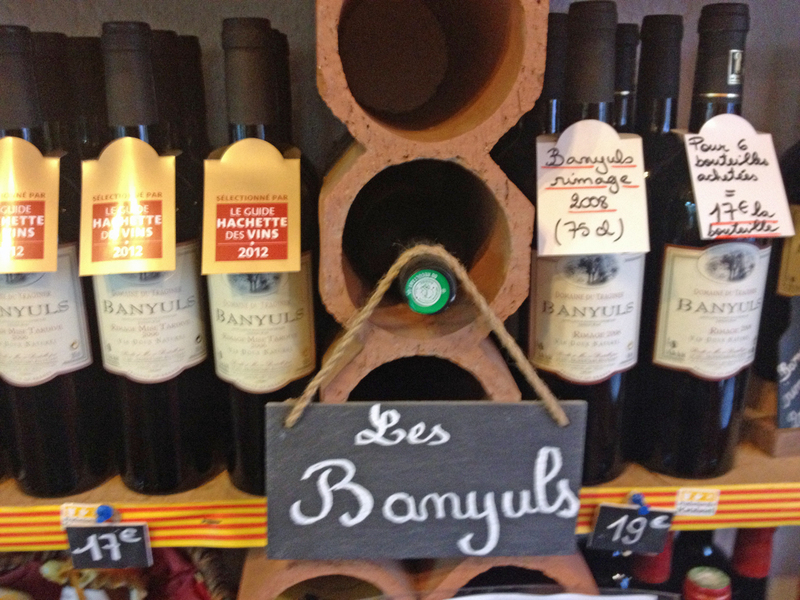 Our first stop was at a small store in Banyuls sur Mer, where we met with Jean-Francois Deu, owner of Domaine du Traginer. The shop also sold other local wines and we tasted a few. I was taken with the 2007 Domaine du Traginer Collioure Blanc, a buttery vanilla which didn’t taste as oaky as its 14 months in a barrel would normally indicate. 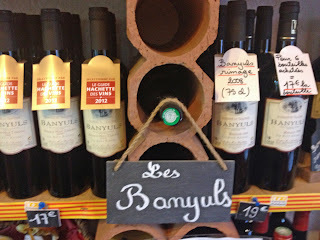 I also liked his 2010 Banyuls Black Granache, a fruit-filled combination of dates and plum. 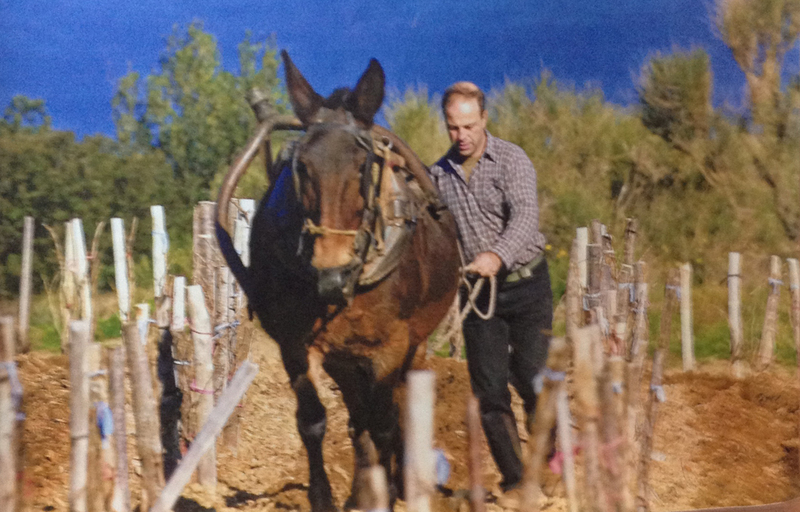 We drove with Jean-Francois up a winding dirt road to see the vineyards he works with his mule. He’s been doing this with his helpers – three donkeys and a mule. The views of the sea and Pyrenees Mountains and Mediterranean Sea were spectacular, but I never would believe someone could cultivate grapes (and make good wine from them) on this red clay if I hadn’t tasted it myself. We took a drive back down to the town to Domaine de la Rectorie, where Marc Parce, president of the areas Cru Management Organization told us about the first white wines made here back in the 1990s and how they actually grew different grapes within the same vineyard instead of blending them later on! My pick at Domaine de la Rectorie was definitely the 2011 L’Oriental, a mix of black grenache and carignan, but I didn’t get to have much as we had another drive to take before lunch. I was still getting over the beauty of Banyuls sur Mer when I was captured by Collioure, from the ancient castle to the hills by the sea. 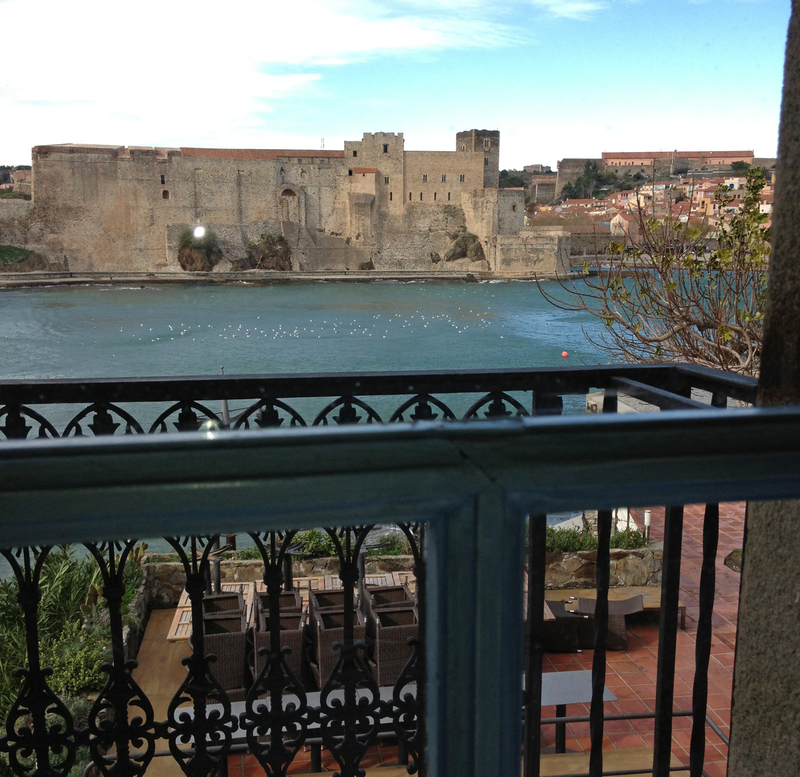 Le Neptune Restaurant offered us incredible views into this seaside paradise – along with fantastic food and wine. We started with a colorful salad and then a Cous Cous cake surrounded by hummus and vegetables. It was just the light meal I needed to offset the heavier wine of the day. The dessert, however, wasn’t quite as light, but I couldn’t resist the presentation filled with chocolate mousse and Bailey’s Irish Cream ice cream. 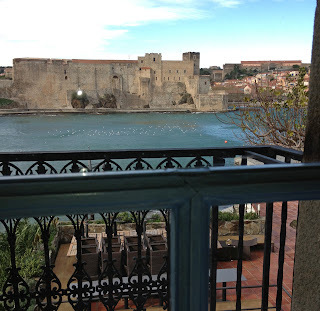 During lunch I tasted some wines whose vineyards we didn’t have time to visit and found the Abbe Rous Collioure Cuvee Rosé to be quite memorable. 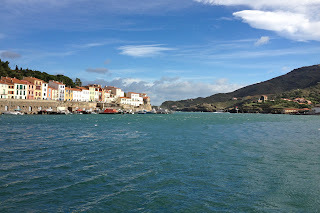 After lunch, we walked around the town and along the sea. It was a windy and cool day, but I still wanted to check the area out and take some photos. Before we left Collioure, we stopped to see the factory of one of their most popular exports, anchovies. It was interesting to watch the workers fold them up to put into the cans. I almost wished I ate fish. I certainly could smell them! 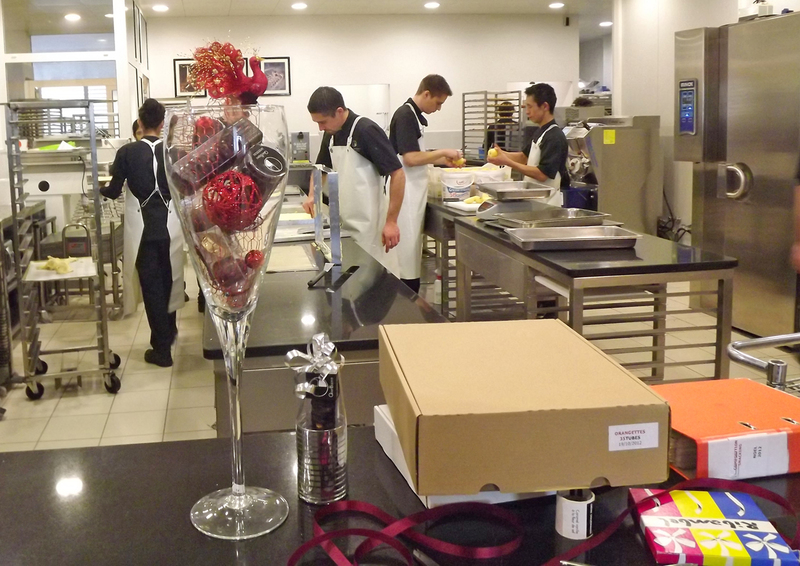 Our next stop was at the bakery compound of Olivier Bajard, who is a award-winning master of sweets. My sweet tooth was definitely salivating as I looked at the cakes, cookies and, of course, chocolate. 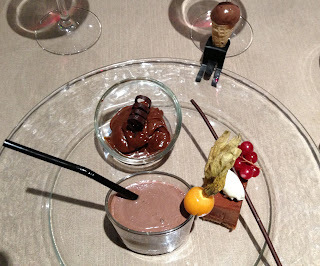 The chocolate selection at Olivier Bajard appeared to be endless, from chocolate bars made from cocoa around the world to truffles in multiple flavors. 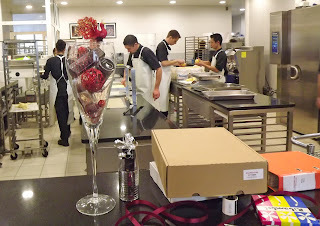 We walked through the kitchen, which was as busy and organized as that of a major restaurant. In a large room at the end, Olivier and his assistant Remy were waiting for us to do a wine pairing with some of their chocolates and French macaroons. 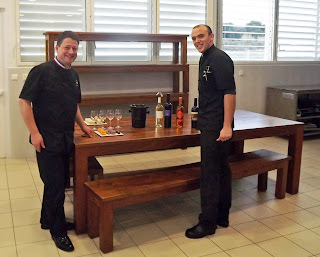 I didn’t necessarily agree with all the pairings, but I did really enjoy all the offerings. If I had to narrow it down, I’d say I was most blown away by the macaroon with cassis and violet. I went back to the hotel for a brief time to change and get ready for what would be a delightful dinner with Christine Campadieu of Domaine La Tour Vielle. 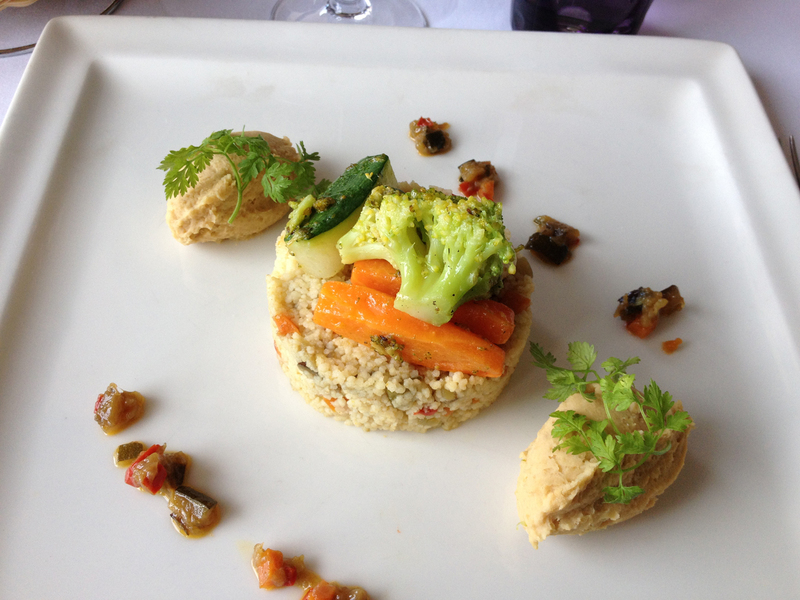 She made the perfect choice in Le Grain de Folie restaurant in Perpignan. It was intimate for conversation and the food was some of the best I had thus far on my trip. 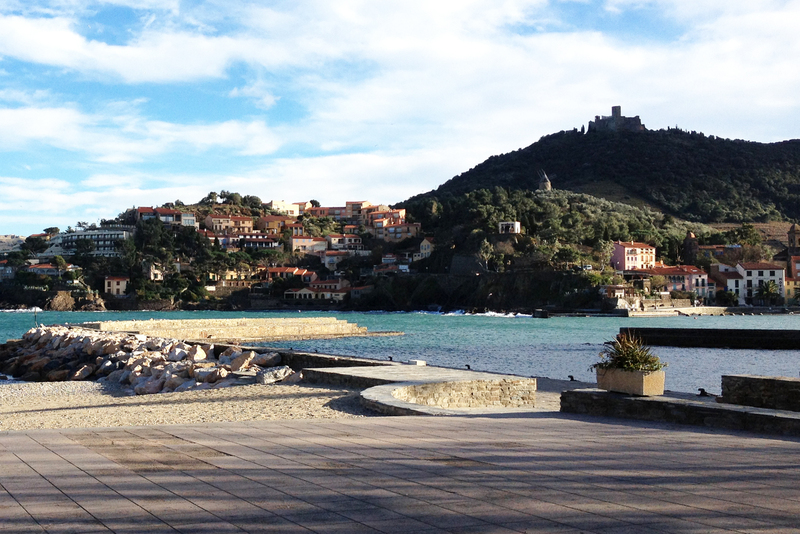 Christine told me about the wines she makes in Collioure, up on a sloping vineyard. She and her ex-husband (and current business partner) produce about 10 different wines that range from dry to sweet. I liked the ones I tried, especially the 2011 Collioure Puig Ambeille, a combination of grenache and mourvèdre. It was perfect with the mini ravioli in a cream sauce with asparagus and mushrooms, served after a delicious salad of artichokes, celery and garlic. Dessert was a sampling and I was glad not to be faced with any big portions. The glace in a tiny cone, mini milkshake, chocolate pudding and mousse cake were definitely the way to finish a most incredible day. 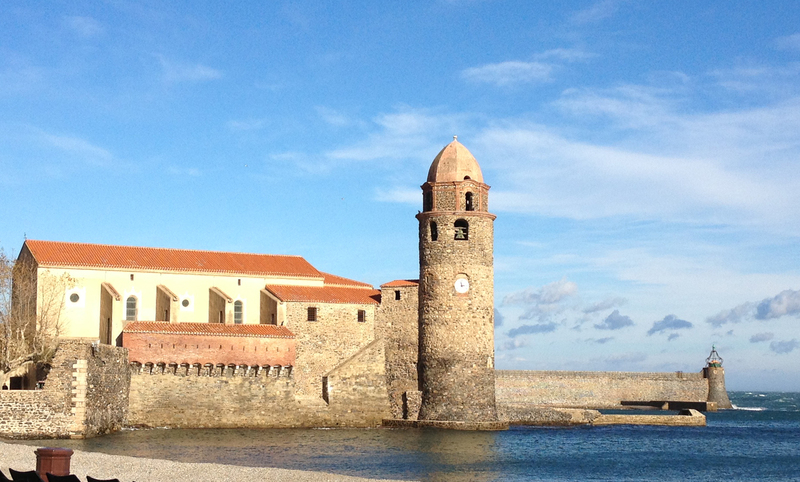 I couldn’t wait to see what else Roussillon had to offer. France is such an enchanting place. It seems that you had a great time there. Pictures are so beautiful. 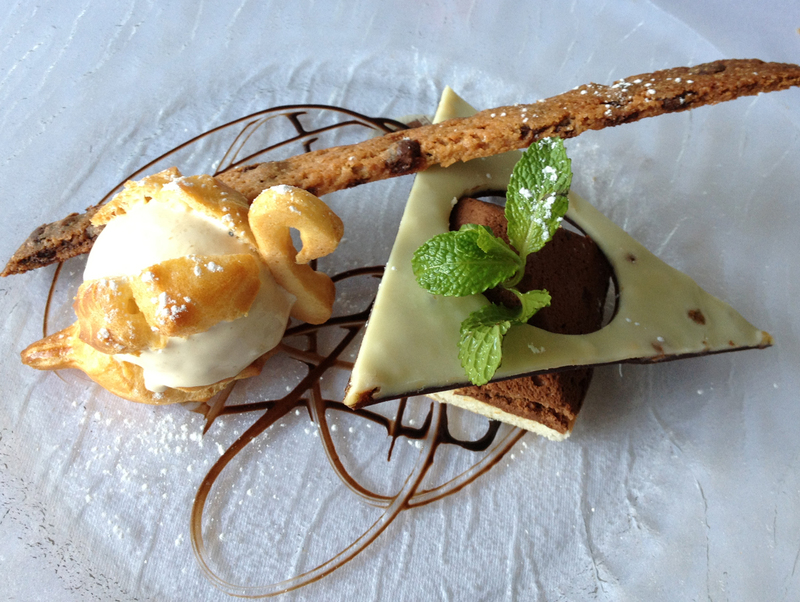 The food looks so Yummy, it's making me hungry :) :). It is an enchanting place you should check out someday! 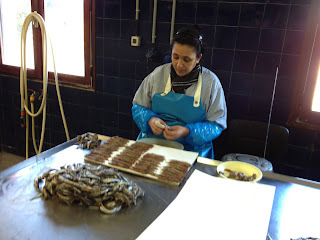 Nice post about France thanks for sharing and giving me information about food and locality and there hotels.